Individual pressure formed plastic pots. 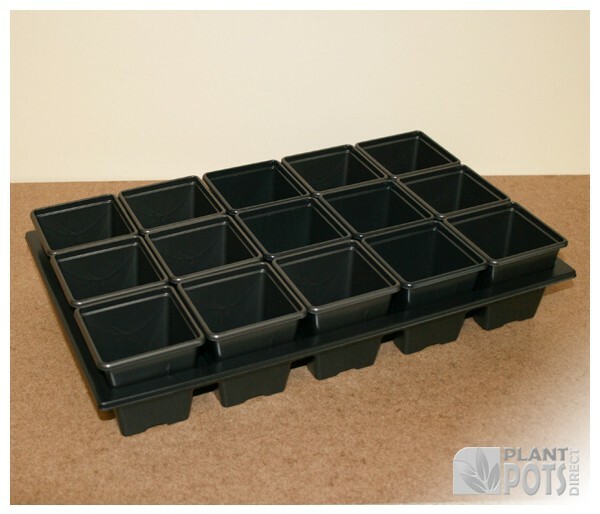 Low priced but attractive square pots for your young plants before planting on. Produce by using a pressure form method, resulting a intermediate strength plastic that can be used for more than one season. Comes with 4 holes at the bottom for irrigation. Carrying trays for (15 x 7cm) singles will ensure the stability of singles pots during production, transportation and marketing. Owing to accurate spacing, very little composts spills between the pots when being filled. Individual pressure formed plastic carry trays. They have one levels of drainage for overhead or sub-irrigation. All edges are rolled down for comfort and safety when handling. Each compartment comes with 4 holes at the bottom for irrigation.